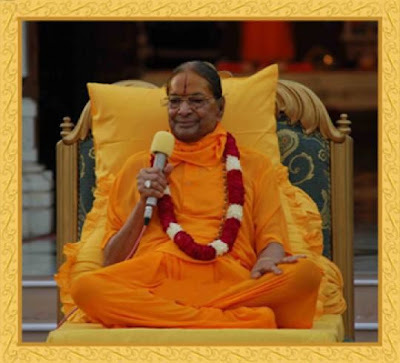 Jagadguru Shri Kripaluji Maharaj: Universal Society of Bhakti Mediation.. Although both materialism and spiritualism condemn each other yet they do so wrongly, for each individual is a combination of both body and soul. Materialism is necessary for the external body, and Spiritualism on the other hand is obsolutely necessary for the inner mind which is related to the soul. In truth, peace and happiness is something that relates to the inner mind; materialism however is necessary to keep the body healthy. Every one knows how to keep the body healthy through materialism with the helf of modern science. But most people are unaware of the inner science that relates to purification of the mind. Thus Spiritualism is indispensable. All religion refer to devotion (Bhakti) to God as the only means of purifying the mind. In order to attain this goal, spiritual discipline (Sadhana) through karmayaga (detached action) is absolutely necessary. "Tasmat Sarveshu Kaleshu Mamanusmara Yudya Cha"
When the mind is with God, and the body is the world, know that to be devotional action. when the body is with God an the mind in the world, know that to be the greatest ignorance. Detached action means constant concentration of the mind on God whilst working in the material world. This peace and happiness can only be attained through devotion to lord Krishna..